In it is contained the idea and challenge that we can have grace for each other. We can choose to forgive little grievances or violations. We can overlook that mannerism in another that we don’t like. We can accept that person even if they really “rub us the wrong way.” We can be more than tolerant, we can be tolerant with whipped topping and a cherry on top. We can allow God to stretch our hearts passed our silly preferences and love that neighbor, co-worker or PTA member. On that day, with that crazy hula dancer I am happy to report I chose forbearance. I chose in that moment to not disqualify her for doing a hula table dance and making us all a bit uncomfortable. 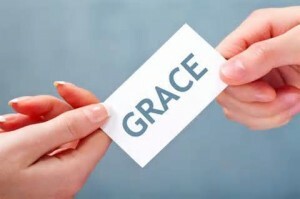 I chose grace for someone I saw as very different from me. And you may have already guessed, ended up choosing a lady who would become one of my very best friends for the last 12 years. So who may God want you to show forbearance for? Who can you make room for in your heart? My daughter recently got a new pair of shoes and her initial blisters are such a great object lesson for understanding forbearance. If your shoe is rubbing tight in one spot you will most likely get a blister – most places of the shoe may fit just fine but there may be that one or two small places that present a conflict between your foot and that shoe. But we all know that if you keep wearing that shoe eventually most will give way and make an allowance for the shape of your foot. Sometimes we are so finicky we only want to deal with the shoes that fit perfectly from the start. And sometimes we seek those out and find them as well. But maybe it is time to take a moment to consider that gal who gave you a blister? Who is that “one” that honestly just “rubs you the wrong way?” Don’t toss them aside! Don’t give up! Challenge your heart to make room for their different shape. Yes you may have a blister for a bit. Yes you may have to get out a scripture and use it as a band-aid to help sooth the place where it rubs. But sisters I want to encourage you to FORBEAR. Because I don’t know about you – but I’m convinced a gal can never have too many shoes or too may friends!